The CLEAN-N-GREEN ANSWER® is an excellent general cleaner. It’s gentle enough for household use but still cleans with the power you’d expect from an EC&S product. This multi-surface product gives you an uncompromising clean while keeping our commitment to environmental responsibility. 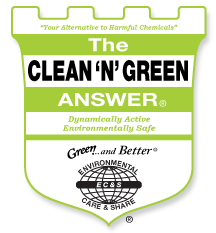 The CLEAN-N-GREEN ANSWER® is a cleaner produced from alkaline water, manufactured by the WRJ-Ag-ROX EO Water Equipment, with a proprietary blend of surfactants, that takes the place of a wide range of harsh chemical cleaners. It is clear and nearly odorless, non-staining, non-flammable, and non-toxic. Extremely versatile, it can be used in hard, soft and salt water, and works well even in cold water. The CLEAN-N-GREEN ANSWER® is 100% biodegradable in the environment in the optimum desirable time of 7 days. Substances that biodegrade too quickly are considered “bio-stimulants” and pollutants as cleaners: Substances that biodegrade in excess of 7 days are classified as “hard” chemicals and are hazardous to human health. The CLEAN-N-GREEN ANSWER® can be used on all water-cleanable surfaces. Though extremely active in a wide range of pH conditions, low pH environments may slow cleaning action.